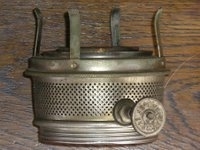 The kerosene lamp, for it to work, required a number of components and all equally as important. 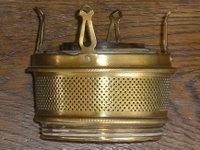 In his range of lamps Edward Miller produced four sizes of central draught burner (somes also called a gallery). 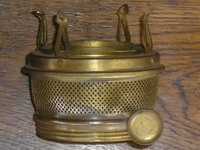 Known as the 'zero', 'one', 'two' and 'three' it was wick raising patent and burner size that generally named the lamp. It is the burner that holds the wick firm, supports the chimney and regulates the flow of air to the flame, thus its size dictated the amount of light one gets from each lamp. 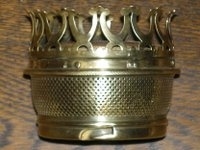 A well designed burner was essential for a bright, clean burning flame. Miller had a number of inovations in his burners. Some allowed the lamp to be lit without removing either the shade or the chimney - and this was important as it helped prevent costly breakages as often happened when you had to lift on and off a lamp its shade and chimney each time you wished to light it. Other inovations saw the introduction of a screw thread, rather than a bayonet fitting to attach the burner to the fount to name a few. Of all of the burner types made by Miller, by far the greatest variation exists to the No. 2 size. It was this size that proved the most practical for every day use, and therefore the styles, types and variations were extensive. Throughout the history of the No. 2 burner is was made in two basic forms. An intricate 3 piece burner and a simpler 2 piece one. To date I have now identified 14 different styles/patents of the No. 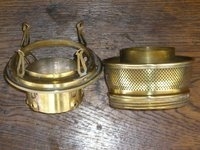 2 burner, some in brass, some nickled brass, totalling over 23 different burners. Many of the burners are stamped with patent dates, however the habit (perhaps through a change in legislation) of putting the patent dates on the burners seems to have ceased completely by late 1898. I have dated each burner for when it was introduced into production from their patent dates, the dates known from the lamps on which they are typically found and other available information. They are estimates. 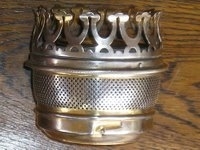 Further, as burners are interchangeable, a lamp should NOT be dated or even identified as Miller from its burner. 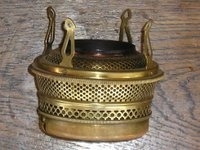 There are three main basic designs of these burners. 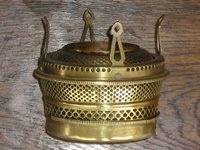 The first, a two piece burner which has a separate wick tube, with the chimney prongs and holder being part of the perforated side piece, the second - a three piece burner which still has a separate wick tube, but with the chimney holder separate but interlocked with the perforated side piece allowing for the chimney to be raised up for lighting without removal. Thirdly a two piece burner where the perforated side piece and wick tube become a single piece, with the removable chimney prongs and holder fitting over the top, again allowing for lighting without the removal of the chimney. 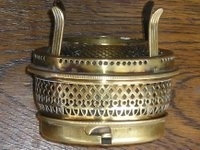 The two piece burner having a separate wick tube, with the chimney holder and perforated side piece being one part. 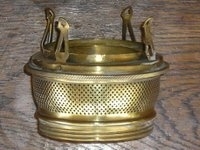 The three piece burner has a separate wick tube, with the chimney holder interlocked with the perforated side piece. The two piece burner perforated side piece and wick tube are a single piece, with a removable chimney holder. It is anyone's guess why Miller made so many No. 2 burners and his production of them is also anyone's guess. For instance, having introduced screw thread burners in 1895, why is he not only still manufacturing the more complicated three piece bayonet burners in 1898, but improving them and laying new petents (an extra row of holes in the chimney holder). I welcome any comments regarding this subject, additional information or evidence that corrects. The tube on this burner, unlike all others I have seen of this type has the dates high, and on the reverse side, has the Miller Logo Crest. 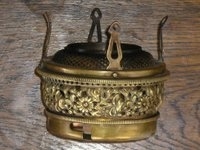 Best quality burner only seen on top of the range hanging & banquet lamps. Second quality screw burner, introduced on Juno lamps. This is the 4th style of this patent type. Although similar to the 1895 best quality burner, the wick tube is completely different. 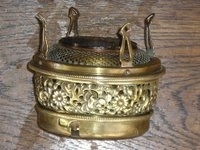 Juno self extinguishing burner - uses Empress type flame spreader. Note change in prong – typical style for late ‘New Juno’s’ and Vestals. Extra holes on chimney holder. Heavy duty burner – commercial usage? 'New Vestal' patent based on the 1895 second quality burner. Brand on thumbwheel. c. 1916 'Ideal' patent based on the 1895 second quality burner. Thumbwheel unbranded. NOTE: Original prong style returns. 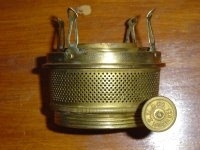 c.1916 'Ideal' patent based on the 1895 best quality burner. Thumbwheel unbranded. NOTE: Original prong style returns.